With your little bundle’s safety at stake, we spent almost 40 hours talking to the experts, studying the latest research on infant sleep safety (Did you know that infants need extra air movement when sleeping? ), poring over hundreds of user reviews, and putting the top offerings on the market to the test. The Arm’s Reach Clear-Vue Co-Sleeper rose to the top as the best co-sleeper for parents who want their child to sleep as close to them as possible while not breaking the bank doing so. First, a forewarning: The American Academy of Pediatrics (AAP) and other organizations strongly discourage parents from ever sleeping in the same bed with their infants. A study by the U.S. Consumer Product Safety Commission published in 1999 found that placing babies to sleep in adult beds puts them at higher risk for suffocation or strangulation. A new study found that bed-sharing increases the risk of sudden infant death syndrome (SIDS) by five times. “Bed-sharing” is defined as when an infant shares a bed with an adult, while “co-sleeping” technically refers to a sleeping situation where baby is in his own bed that’s attached to an adult one. However, in recent years, “co-sleeping” has become an all-encompassing term for both types of sleep situations. Our product pick is a true “co-sleeping” bed that that separates baby from his sleeping parents and gives him his own safe sleeping space. While the editors at The NightLight don’t endorse “bed-sharing” products, we know that some parents will use them anyway. So we’ve added our safety findings below (See “A bit on in-bed positioners”) to help you make an informed decision. WHO NEEDS A CO-SLEEPING BED? The number one goal of all new parents is getting baby to sleep through the night. We’ve all been known to resort to just about anything: singing, dancing, pulling an all-nighter in the swing and even loading up baby for a drive around the block. Sleep deprivation breeds desperation. Sometimes that even means bringing baby into the bed with you at night. Despite stern recommendations against co-sleeping and bed-sharing, one study found that more than 50 percent (yes, half!) of parents in the District of Columbia, at some point, had brought their babies into bed with them. Other parents choose to co-sleep right from the start. A recent study showed that in 2010, 14 percent of parents said their infant “usually” shared their bed–a figure that’s up from 7 percent in 1993. Co-sleeping, according to the proponents at the Attachment Parenting International Research Group, benefits babies in a number of physical ways, including more stable body temperatures, regular heart rhythms, and fewer long pauses in breathing. They also believe that co-sleeping encourages breastfeeding, bonding, and the overall emotional well-being of the baby. So, if you’ve read all the fine print and have decided to co-sleep—or if junior’s been in your bed a few too many times recently—but you’re still kind of freaked out by the idea, there are products on the market to help calm your fears. There are two types of co-sleeping products—bedside sleepers and in-bed positioners. Bedside sleepers are free-standing bassinets with one side that attaches to the side of an adult bed. The side closest to the parent folds down, a design that allows easy overnight access to baby. In-bed positioners are like little nests placed in the middle of the parents’ bed that give babies their own designated sleeping space and are designed to keep mom and dad from rolling over baby. Our recommendation for the best co-sleeper from Arm’s Reach is a bedside sleeper, not an in-bed positioner. Co-sleeping products are designed to be used by infants from their first night at home through about 5 months of age, or until baby starts pushing up and rolling over. If you’re not decided on a co-sleeper, you may want to read up on our page about the best cribs. WHAT MAKES A GOOD CO-SLEEPING BED? Keeping in mind that safety is the number one priority when choosing a co-sleeping product, we began our research by looking for recommendations from credible media experts and sources. We found that there’s just not much guidance out there on the subject. Consumer Reports’ Bassinet Buying Guide didn’t offer much guidance except saying to avoid co-sleeping as advised by the AAP. And we were quite skeptical of a list of best co-sleeping products from a website called Bestcovery because there were no credentials listed for the writer/reviewer. Other than that, it was just crickets from leading parenting magazines and websites. The next step was to contact the top agencies that help ensure products used by infants are safe, the U.S. Consumer Product Safety Commission (CPSC) and the Juvenile Product Manufacturers Association (JPMA), to ask them about co-sleeping products. In January 2014, the CPSC approved U.S. standards for bedside sleepers (not in-bed positioners) that were based on international standards created by ASTM, an organization that has helped establish more than 12,000 product standards used globally. The international standards for bedside sleepers, which were established in June 2012, are known as ASTM F2906. The CPSC standards went into effect in July 2014. Nychelle Fleming, public affairs specialist and team lead for the for the CPSC’s Safe Sleep Outreach and Education program, said the federal agency is also monitoring in-bed positioners and will investigate if a safety incident arises. So far, none have. We found co-sleeping products on the market that convert to bassinets and play yards and others that can be used as travel beds. Some models even have lights, vibration, and sound. While these bells and whistles could come in handy, they’re simply not necessary and shouldn’t be a deciding factor when choosing a co-sleeping product. For us, low cost was also an important selling point—not because we’re cheapskates but because you just won’t be using this product for very long. “Arm’s Reach basically established a brand new product category that didn’t exist before,” explained Sharon Forspan, spokeswoman for Arm’s Reach. The product gained popularity through word of mouth and the support of breastfeeding support groups such as La Leche League, she said. Almost immediately after the Co-Sleeper’s introduction, two of the world’s leading authorities on co-sleeping—James McKenna and Dr. Williams Sears—began recommending the products and now they both formally endorse the products. McKenna, an anthropologist at the University of Notre Dame and author of Sleeping with Your Baby: A Parent’s Guide to Cosleeping, told us that, “Arm’s Reach Co-Sleepers have had all the proper components from the start—the baby can sleep separate, but Mom can drop down the side to access her baby for soothing and nursing.” He also firmly believes in the product’s safety: “The fact that it’s been on the market for decades with probably 1.5 million units sold without any deaths or accidents is a big selling point.” He said the materials and substances used in the Arm’s Reach Co-Sleepers meet all the crib and bassinet safety standards. Parents, too, love Arm’s Reach bedside sleepers, with their products taking four of the five top-seller spots in their category on Amazon and getting rave reviews there and on BabiesRUs.com. And in another positive sign, the JPMA spokeswoman we talked with told us that Arm’s Reach is planning on participating in the JPMA’s certification program as soon as the CPSC finalizes its federal standards for bedside sleepers. We’d be lax not to tell you that in 2011, Arm’s Reach cooperated with the CPSC for a voluntary recall of 76,000 of its bedside sleepers manufactured between September 1997 and December 2001. The recall described this hazard: “When the fabric liner is not used or is not securely attached, infants can fall from the raised mattress into the loose fabric at the bottom of the bed-side sleeper or can become entrapped between the edge of the mattress and the side of the sleeper, posing risks of suffocation.” While there were no injuries reported, there were 10 cases of babies falling from the sleeper or getting trapped between the sleeper and the adult bed. We spoke to the Arm’s Reach spokeswoman about the recall. “As our products are frequently passed around among friends and family members, parts and instructions tend to get lost,” Forspan said. “This was a recall to alert consumers to check for parts and to make sure they’ve installed the product correctly.” Indeed, the products that were named in the recall were at least a decade old, and no injuries have ever been reported associated with Arm’s Reach bedside sleepers. Knowing that our experts unanimously recommend (and many parents favor) a bedside sleeper for co-sleeping and that Arm’s Reach is the only maker of them, we took a closer look at the company’s offerings. While all Arm’s Reach Co-Sleepers meet the ATSM standards, we wanted to narrow it down to the best pick for parents based on safety, for obvious reasons, and price, simply because your baby will need a new spot to sleep at about 5 months, the age when most babies can push themselves up and roll over. And why splurge on the best-looking co-sleeper when it will probably never leave your bedroom? Arm’s Reach sells 9 varieties of co-sleepers. Most aren’t very stylish, with the exception of the real-wood Sleigh Bed Co-Sleeper and the Cambria, which features dark wood trim with quilted fabrics. The other models come in very neutral colors—think shades of cream, tan, and brown, plus a few options in pastel blues and greens. Prices also vary widely, from $120 to $360. Because the Arm’s Reach bedside sleeper is really just a crib with one side that attaches to an adult bed, we quickly eliminated the models that included thick padding all around the sides. Why? 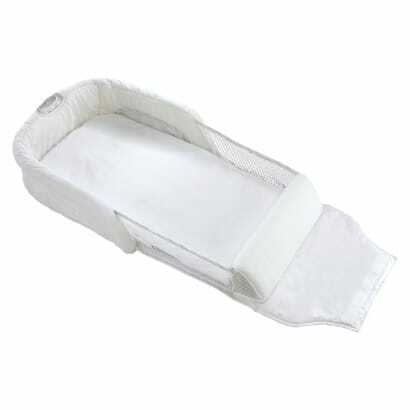 In 2011, the AAP issued new guidelines urging parents not to use bumper pads in infant cribs. The AAP said there’s no evidence that crib bumpers keep babies from being hurt and instead boost the risk of suffocation, strangulation, or entrapment for young infants too weak to move or turn their heads when something blocks their breathing. We instead looked for models with the most mesh siding. Why? Mesh lets air circulate around baby’s sleep environment, and poor ventilation while sleeping has been linked to sudden infant death syndrome (SIDS), with the current thinking being that “rebreathing” exhaled carbon monoxide could be to blame. Keeping in mind that price is a factor on a product you’ll be using for about five months max, here are Arm’s Reach models we ruled out based on price and too much padding: Ideal Ezee, Mini Ezee, Cambria, and the Duplex Pet Bunk Bed (we’re not joking). Our pick, the Arm’s Reach Clear-Vue Co-Sleeper has mesh panels all the way around, helping baby breathe easier and letting you keep her in sight from all angles. It also rings in as the cheapest of Arm’s Reach Co-Sleepers. The Clear-Vue’s legs extend on their own and fit beds that are 26 inches, 28 inches, and 30 inches tall. Of course, if you have a bed shorter or taller than that, the Clear-Vue won’t work for you. We didn’t rule out in-bed positioners without checking them out. One of our experts, McKenna, isn’t a fan. He fears the products will create a false sense of security—and that parents could become lax and accidentally roll over baby or cover him with a blanket. But plenty of parents use them and like them. But if you’re set on an in-bed positioner, we like The First Years Close and Secure Sleeper. I popped one into my queen-sized bed (sans baby) to check the fit. It felt like I was sleeping against the wall in a twin bed. I appreciated that the sides were low enough to that I could see baby’s sleep area and reach inside with ease. I also liked that I could see my partner on the other side. Unlike Arm’s Reach bedside sleepers, this little nest folds up for travel. As for McKenna’s concern that a parent could roll over the baby while using an in-bed positioner, I don’t see how that’s possible with The First Years Close and Secure Sleeper. The sides are high and rigid enough to prevent that. Our new mom product tester wholeheartedly agreed, adding: “After a Caesarean, any leaning or extra effort was a huge deal. It was easy to get baby in and out of this sleeper. There was sturdy mesh lining in all the right places.” Amazon users give it 3.9 out of 5 stars and Walmart.com users give it 4.4 out of five. We considered these alternatives, but they fell short of making our best co-sleeper list. SwaddleMe By Your Side Sleeper takes up a lot of room in bed, and the sides are so high, you’ll find yourself sitting up in bed to soothe and nurse. A deluxe version is available for purchase which offers a soft nightlight, lullabies, and soothing vibrations. The Baby Delight Snuggle Nest has an open end and some parents have reported that baby wiggled out. Please know this model has been discontinued by the manufacturer. It has been replaced by the Snuggle Nest Afterglow and the more deluxe version, Snuggle Nest Harmony (includes womb sounds, music, and a removable incline wedge). 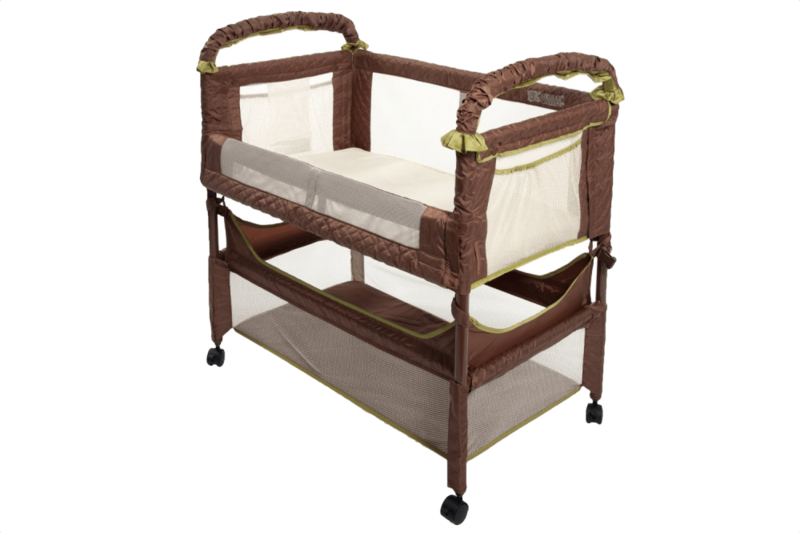 LulyBoo Baby Lounge To Go: While not marketed specifically as a co-sleeping product, parents could be tempted to toss this into their bed. Don’t. The sides aren’t sturdy enough to prevent parents from rolling over them. BRICA Fold N’ Go Travel Bassinet: This is a similar travel product that may be considered as an in-the-bed cosleeper, but we can not recommend because of its collapsible mesh lining. We do, however, love this as an option for camping or nap time during quick visits to grandma and grandpa’s house. Snuggle Me Organic Original Co-Sleeper: Though we can see this being used as an infant lounger, we do not recommend using this as an in bed co-sleeper. There are no protective edges making it still possible to accidentally roll over. DockATot Deluxe+ Dock: We love this as a tummy time aide or a temporary portable sleeping solution, but similar to the Snuggle Me, we do not recommend this as an in-bed co-cleeper.Though it is CPSIA 2008 Compliant, it only meets ASTM F963-11 which is testing for overall toy safety. When using the Arm’s Reach Clear-Vue Co-Sleeper, or any other baby co-sleeper/bed-sharing product, it’s crucial for your baby’s safety that you follow the manufacturer’s instructions for assembly, installation, and usage to a T. In addition, always be sure to follow safe co-sleeping practices. From the safety features to the cost, plus the fact that experts just can’t get enough of this and other Arm’s Reach bedside sleepers, the Arm’s Reach Clear-Vue is the clear best co-sleeper choice for most parents, whether they plan to co-sleep or just want some peace of mind during those nights baby joins them in their bed. 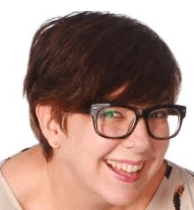 Kim Hays is a former senior editor at Parenting and Babytalk magazines currently working as a freelance writer and wrangling her elementary-school age twins. Interview, Julie Vallese, managing director of public and government affairs, Juvenile Products Manufacturers Association, 1. Interview, Julie Vallese, managing director of public and government affairs at the Juvenile Products Manufacturers Association. Interview, Nychelle Fleming, public affairs specialist and team lead, Consumer Product Safety Commission’s Safe Sleep Outreach and Education program. Interview, Sharon Forshpan, Arm’s Reach Concepts owner and spokeswoman. Interview, Kim West, The Sleep Lady. “POLICY STATEMENT: SIDS and Other Sleep-Related Infant Deaths: Expansion of Recommendations for a Safe Infant Sleeping Environment”, Task Force on Sudden Infant Death Syndrome, American Academy of Pediatrics, October 2011, 12. “POLICY STATEMENT: SIDS and Other Sleep-Related Infant Deaths: Expansion of Recommendations for a Safe Infant Sleeping Environment,” Task Force on Sudden Infant Death Syndrome, American Academy of Pediatrics, October 2011. “Co-sleeping and your baby”, KidsHealth from Nemours, 18. “Co-sleeping and your baby,” KidsHealth from Nemours. 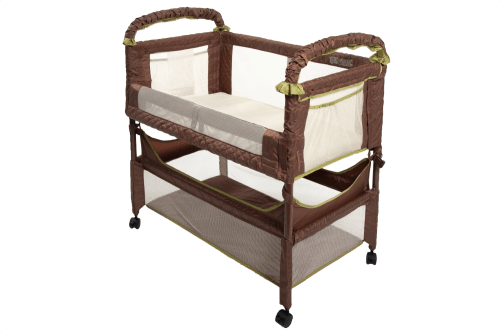 “Arm's Reach Concepts Recalls Infant Bed-Side Sleepers Due to Entrapment, Suffocation and Fall Hazards”, Consumer Product Safety Commission, April 2011, 19. “Arm's Reach Concepts Recalls Infant Bed-Side Sleepers Due to Entrapment, Suffocation and Fall Hazards,” Consumer Product Safety Commission, April 2011. “Get bumpers out of cribs, doctor group urges”, Parenting magazine via CNN.com, October 2011, 20. “Get bumpers out of cribs, doctor group urges,” Parenting magazine via CNN.com, October 2011. Tara Parker-Pope, “Fan in Baby’s Room Lowers SIDS Risk”, New York Times, October 2008, 21. “Fan in Baby’s Room Lowers SIDS Risk,” Tara Parker-Pope, New York Times, October 2008.